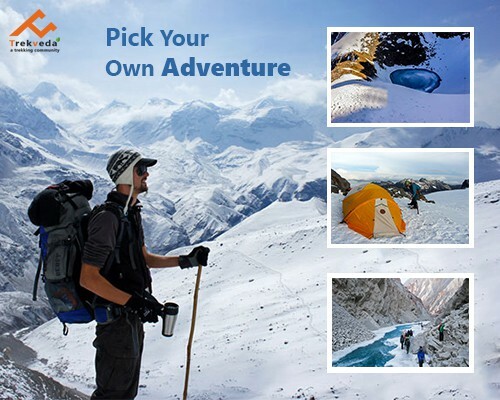 Trekking is one of the most enthralling adventures that people love to do. An adventure that takes you to the different heights where you explore yourself and the inner peace by connecting with the nature. Trekking can be done anywhere in the mountains and hilly areas where there is a lush green forests, sparkling water, fountains and the lap of Mother Nature but before you head, there are certain things that you need to pay heed upon. If you’re going to adventure for the first time, then there’s a lot more things to understand than you think you should. Primarily, your physical fitness and that has nothing to do with your strength or muscle power. Yes, being strong doesn’t imply being fit. Being fit means being able to bear the pressure, having stamina to hold yourself in the adverse condition. Apart from the physical fitness, one should also be perfect to bear the psychological pressure since there are constant change in the weather and conditions are far different from what we see in the plains. Based on above discourse each trek has been given a category in view of the level of difficulty to be experienced. The categorization is liable to change in view of fluctuating conditions and may even change year to year. In any case, regardless it gives a decent picture of what you are probably going to understanding up there. Simple: These treks have 3 to 4 hours strolling every day and can include some climb and plunge. These treks are open for the amateurs and families. Moderate: These treks for the most part have 4 to 6 hours of strolling every day and can include a sensible measure of rising and drop. This grade is appropriate for somebody healthy and who is consistent walker. Reasonable for any individual who is accustomed to strolling on ends of the week or something like that, no past trekking background required. 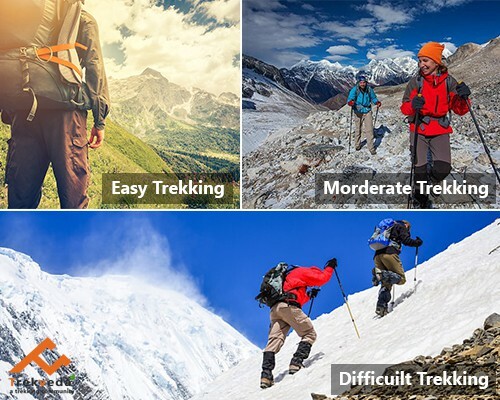 Difficult: Anything from 10 to 15 days of trekking with traverse 5000m. Extreme mountain landscape will be experienced including scree inclines, frosty moraines, or regions with no appropriate ways. No specialized climbing/mountaineering aptitudes required however impressive stamina will be required. High-alt treks are an incredible method to explore the world. Miles of strolling on rough territory, over cold icy masses and moraine untouched by the ministrations of human progress, gives you a cozy affair of the place. India with its differing geography of mountains and waterways is a favored goal for trekkers and enterprise aficionados. The Himalayas with their numerous concealed trails and persona are particularly prevalent for high-height treks. Over the most recent couple of years, trekking in India has turned into a famous adventure for thrill junkies searching for an endeavor to tour outside. Trekking like some other game has diverse levels of capability. The classification of treks depends on the idea of the territory, elevation, angle and so on. You can pick your adventure in light of your own solace level and have a really paramount experience. The most essential grade of trekking is self-obviously named "Simple". This is a casual trek with 3-4 hours of strolling every day. There are some slight climbs and plummets, however these are for the most part genuinely simple and don't require any earlier mountain trekking background. Most Himalayan treks, including the simple ones can go up to heights of 3500-4000 meters. Trekveda offers some flawless trekking bundles in India like the Chandrashila visit and the Surya Top - Dayara Bugal trip which are "Simple"- evaluated trips. These are for the most part relaxed treks with short strolls that don't require much physical effort. The Chandrashila trek is a 3-night, 4-day trip that gives some extraordinary perspectives of celebrated pinnacles like Choukhamba and Kedarnath-both sacrosanct journey destinations for Hindus. In case you're quick to encounter trekking in Rishikesh with your family or close ones, this is the outing for you. The main day of the trek facilitates you in with a short 1-hour trek from Sari town to Deoriatal where you remain overnight in camps. Whatever remains of the adventure too is laid back with continuous climbs and moderate paced treks. The fundamental thought here is to give you a chance to investigate the landscape at your own pace and absorb the excellence of the environment. The outing offers some incredible perspectives of pinnacles like Nanda Devi, Trishul and so forth. You at last come to the Chandrashila summit at 4000 meters, in spite of the fact that the trip is a moderate and estimated one. Another Easy adventure among our trekking bundles in India is the Surya top - Dayara Bugal trek. This outing is flawless not only to be simple, but rather it additionally offers the most comprehensive experience of the Himalayas. Trek through lavish cedar and rhododendron backwoods, spot uncommon types of nearby and transient winged animals, visit remote Himalayan towns for a knowledge into the lives of indigenous individuals lastly achieve the Surya top at 3900m with awesome perspectives of the range all around. This too is an outing that can be delighted in with family and doesn't require much life or effort. Moderate treks are somewhat more difficult than simple ones and suit the individuals who are in sensibly great wellbeing and used to a moderate level of activity. Moderate treks normally involve 4-8 hours of strolling in a day with some precarious risings and downhill courses. Having said that, these treks don't require any extraordinary preparing and can be finished even by first time trekkers searching for a test. TrekVeda offers a wide assortment of Moderate grade treks crosswise over north India with an extraordinary spotlight on the Himalayas. Markha Valley trek in Ladakh is a 4-night, 5-day trip that takes you to Kongmaru La go at an elevation of 5200 meters. This is the most elevated purpose of the trek which is come to towards the finish of the outing. From here it is a precarious 2-hour plummet which step by step winds up noticeably level after moving toward Shange Gorge with its inquisitive shake developments. Our Yamunotri to Dodital visit is another Moderate grade trek finished in 5-evenings and 6-days. The trek is brimming with crisscross courses through backwoods, winding risings and soak downhill ascensions. We have the best Himalayan trekking guides who are with you consistently you safe on the visit. Some of these Moderate grade treks additionally include crossing frosty icy masses and moraine. The Pangarchulla trek in Uttarakhand takes you to the Kuari Pass at 3860 meters. You have to stroll through a timberland and over an edge to get to the pass. While this is genuinely simple, a lofty plunge of 200 meters is additionally testing a Moderate result of the wet and frosty states of the landscape. Because of the tricky idea of the incline, trekkers should be aware of their balance and adjust. Difficult experiences are the most astounding evaluation in the grouping of treks. They for the most part require a propel level of wellness for extend periods of time of strolling on hilly landscape, frequently under testing conditions. Difficult treks are strenuous in that they involve more than 8 hours of strolling or more to cross mountain passes. In India, these treks cover heights of more than 5000 meters, as a rule over cold moraines, scree slants and zones with no appropriate ways. The trek to Mount Stok Kangri in Ladakh is an incredible case of this grade of trek. Hailed as a standout amongst the loveliest crests in Ladakh, Stok Kangri remains at an elevation of 6150 meters that we move in the traverse of seven days. This is an awesome accomplishment that can't be accomplished anyplace else in Asia. The last leg of the rising starts from the base camp at 5000m. For this last summit push, we leave amidst the night when the snow is harder and less difficult to stroll on. Contingent upon snow conditions, we utilize snow tomahawks, ropes and crampons for trekking up the incline. The climb takes 7 to 8 hours and is very strenuous. Our Lamayuru to Darcha trek in the Lahaul and Spiti valleys of Himachal Pradesh, is another difficult trip crossing 20 days. The trek takes you more than 8 mountain disregards 4000 meters with the most noteworthy point being 5400 meters. Aforementioned data analysis gives the best picture to the trekkers, who are fond of adventures in the mountains. Above mentioned three categories or grades are important since they give us an idea to choose, which and where according to our physical and mental endurance.